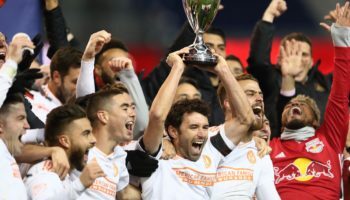 NEW YORK – New York City Football Club continues to take advantage of the gifts its opponents seem to literally hand it late in matches at Yankee Stadium. Forward Jesús Medina scored the game-winner in 80th minute, set up by a careless turnover by Columbus goalkeeper Zack Steffen, as NYCFC once again left it late before pulling out a 2-0 victory over the Crew on Saturday night in the Bronx. The win, which was the team’s third consecutive clean sheet, completed a perfect three-game homestand for NYCFC this week, with all of the games decided on second-half tallies. Like last weekend’s win against the New York Red Bulls, when a Tyler Adams turnover in the back immediately led to the game-winning goal scored in the 85th minute, Columbus also was its own worst enemy in conceding the goal that eventually decided the game. Steffen attempted to play the ball forward on the ground from the back, but his misplaced pass was intercepted by New York City midfielder Jonathan Lewis near the top of the penalty area. Lewis’s one-time effort off of Steffen’s shank hit the bottom the post, but the ball then rebounded right back to Lewis, who set up Medina with a pass to the right before the latter scored with a left-footed effort inside the box. Defender Anton Tinnerholm sealed the win for NYCFC with a 90th-minute goal, as he drove the ball up the pitch on the right before squaring up and firing past Steffen. Along with a good bit of fortune, Lewis’s play in setting up the first goal also came down to instinct as well. Steffen’s gaffe is the latest setback in a tough two-month stretch for the Crew, who are just 1-4-3 in their last eight league matches. The first half was a back-and-forth affair with both teams playing at a high tempo. Despite some good looks at goal, including eight shots by the Crew from inside of the box in the first 45 minutes (three on goal), neither team was able to capitalize and find the game’s first goal. 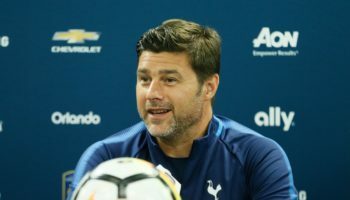 Columbus had not won a road game since a May 19 victory in New England, yet, led by midfielder Federico Higuain’s ability to dictate plays on both ends and control the pace of the game at the beginning of the game, the Crew arguably played as well as any visitor to Yankee Stadium this season – where NYCFC remains unbeaten (10-0-1). 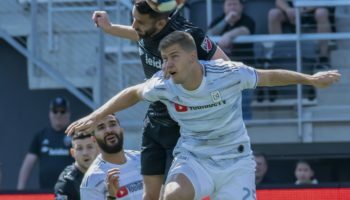 “I think we executed very well and it’s disappointing to not get a result, get any result,” said Crew head coach Gregg Berhalter. 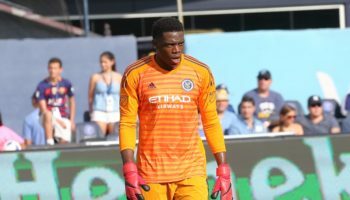 Columbus’ total of five shots on target in the game were all dealt with by NYCFC goalkeeper Sean Johnson, who now leads Major League Soccer in clean sheets with eight after his third consecutive shutout. “Three wins in a row, especially at home, not conceding, eliminating opportunities. The mentality of players had to be strong,” Johnson said. Coming out of the intermission, the boys in blue looked much more organized in the second half as they were able to create open shots and better scoring opportunities. 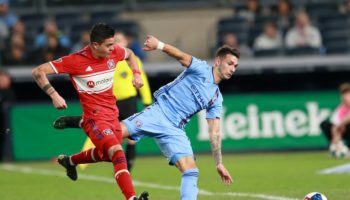 NYCFC head coach Domènec Torrent conceded after the game that his team – competing in its third game in seven days – played the first half with tired legs and had a subpar first half. The tactical changes made at halftime yielded dividends. In the second half, NYCFC took over possession and more than doubled the number of shots they took. They ended the game with 18 shots, five on target, and two in the back of the net. Ball movement and closing the gaps for the Crew seemed to be key. NYCFC now pulls into a tie with Atlanta United atop the Eastern Conference standings at 40 points, and will next take the field in a couple of weeks when they travel to face Orlando City SC on Thursday July 26. Columbus also has Orlando City next on its schedule as it will go back home to the Buckeye State before hosting Orlando next Saturday.